Being prepared is a beautiful thing. Imagine that every time a job in your home needs to get done, you flash a grin because you know you've got what it takes to get it done. 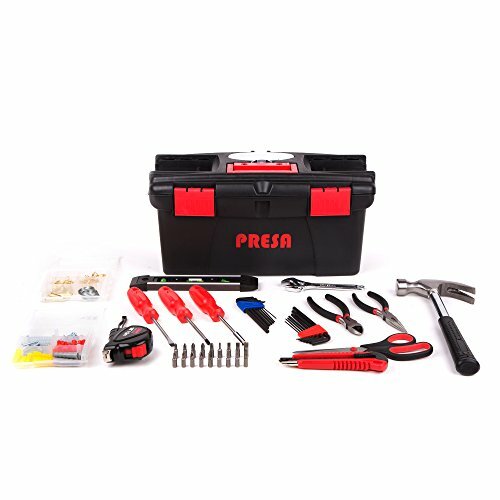 This 150-Piece Essential Home Owner's Tool Kit makes that easy with all the essential tools you need. Every tool is form fitted in the included tool trays, which fit neatly into the tool box to keep your tools in place. When it's time to get to work, you won't need to rummage through a pile of tools to find the screw you need. Inside the toolbox, there's also a removable dual-sided storage tray to keep some of your most commonly used tools that you'd like to keep handy. This complete set includes the following tools: (1) 16 oz. claw Hammer, (1) utility knife, (1) 16 ft. measuring tape, (1) 9 in. level, (1) 6 in. long nose pliers, (1) 6 in. diagonal pliers, (1) 6 mm slot screwdriver, (1) Phillips screwdriver, (1) bits driver, (7) Allen key (Metric) 1.5, 2, 2.5, 3, 4, 5 mm, (7) Allen key (SAE) 1/4, 3/16, 5/32, 1/8, 3/32, 5/64, 1/16 in., (1) 8 in. scissors, (1) 6 in. adjustable wrench, (1) 18 bit set: 25 mm long, CR-V material, including: PH: 3, 2, 2, 1, 0, PZ: 3, 2, 2, 1, 0, Torx: T30, T25, T20, T15, SL: 7, 6, 5, 3. This set also includes 107 pieces of assorted household hardware: (4) #10 anchors, (8) #8 anchors, (15) #6 anchors, (6) 1 in. cup hooks, (19) 7/8 in. cup hooks, (6) 50 lb. picture hangers, (10) 30 lb. picture hangers, 10 1-1/2 in. nails, (10) 1 in. nails, and (1) 6 ft. iron wire.